In my last post I may have given the impression that the capitalist mode of production will implode in a cataclysm or apocalypse. An Armageddon, if not a Christian type of end story, still an end story. Well, maybe I was feeling a little conspiratorial in my last blog. Marx was right, of course, in his prediction of the end of the capitalist mode of production, but a child could have done the same. It’s obvious that all things come into ‘existence’ at some point and then leave at another point, although ‘come into existence’ is misleading. None of us is made of ‘new’ material. We are made of recycled material. I can’t remember who said it but it seems to be true (http://www.zyra.tv/lbreath.htm) that every breath you take, you take in some molecules from Julius Caesar’s last breath. That notion was brought home to me today as I walked through Mountain View Cemetery in Vancouver and saw the smokestack spewing smoke out of the crematorium. Yes, breathing the ‘air’ means breathing all kinds of molecules, many of which previously inhabited people, some just now literally going up in smoke not 30 metres from me. Doesn’t sound particularly appealing, but it’s true. No, all things come and go, but not completely or finally. We just get recycled. I tell me students every year that they are probably eating bits of their ancestor’s molecules when they eat their McDonald’s burgers. Grosses them out. The capitalist mode of production is no exception to this rule. The capitalist mode of production was born in the contradictions between the ruling feudal aristocracy and the peasant classes. The feudal system of governance was born in the dissolution by internal contradiction of the Roman empire. Revolution is a process, not an event. 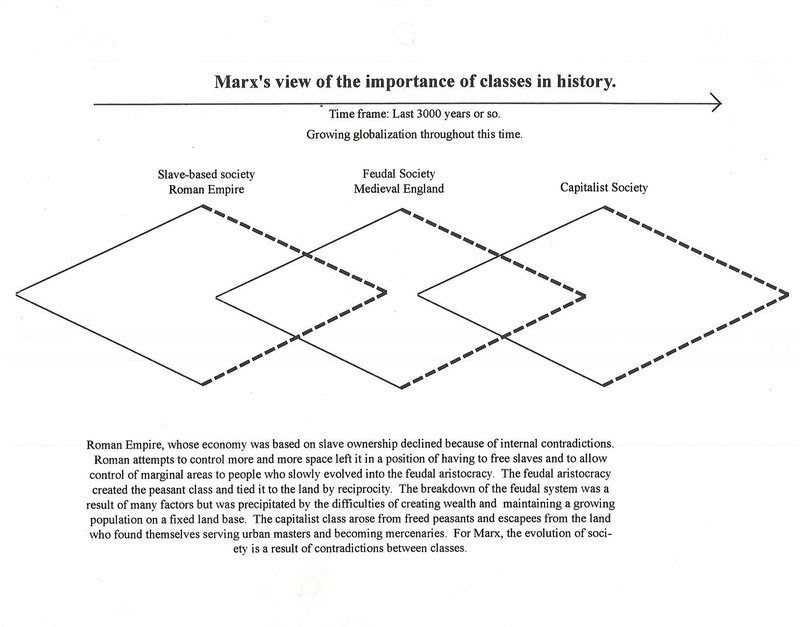 As you can see from the graphic I attach here, European history is based on a series of transformations that take decades if not centuries to complete if they ever really ‘complete.’ Feudalism is long dead, but some of the old monarchies still persist if only symbolically and for hegemonic reasons. The concentration of capital in commodities rather than in land as had been the case if feudal times, began during the flowering of Medieval society but it didn’t become the predominant mode of production until political and economic forces combined to unleash fettered commodity production and exchange in the law courts, parliaments and government bureaucracies all over Europe. The move of capitalist exploitation into North America and elsewhere through colonialism accelerated the process. My point here is that ‘revolutions’ take time. They are not events, although they often engender massive violent events and social upheavals much as volcanoes do. The ‘French Revolution’ was less a revolution than an episode in a process of the creation of the French ‘nation’ as a vehicle for capitalist expansion into manufacturing and finance. We all are born, grow into adulthood, decay and die. This isn’t rocket science, but we live as though it weren’t true and much of what we call science in the social sciences is based on the denial of this fact. The capitalist class at the moment can be smug in its virtual total control of all national governments, even that of China. But it’s time will come. When it puts us all out of work, it will have no way of creating surplus value and profit. It will be unable to sustain itself and grow. However, the legacy of technique and technology, that ‘labour-saving technology’ we were all ga-ga over a few years ago is what will provide the basis for a future communistic mode of production, one that will not lead to the concentration of capital in individual hands, but, instead will remain in the public trust. We will be truly ‘public’ then, but don’t hold your breath, we have some time to go before the end of capitalist concentration of wealth. A ‘communistic’ mode of production cannot dominate the world’s productive forces until all the forces of capitalist production are exhausted. And exhausted they will become. Again, more on that later although I can say that my next post will be about communism and lies, lies on every which side. Communism has never existed on this planet except as an ideological rallying point. Never as a real productive, predominant force.